When the fledgling United States took legal possession of Wisconsin lands at the close of the Revolutionary War, few seemed to care. The new American government had more important priorities than the remote Wisconsin frontier. The handful of French-Canadian fur traders who lived in Wisconsin cared little about the squabbles of the English-speaking Protestants in Boston and London. Most of the state's residents were Indians who needed good relations with both American and English fur traders to survive. The fur trade continued to flow from the Ojibwe, Menominee and other tribes through French-speaking traders in La Pointe and Green Bay, and then on to English-speaking merchants in Montreal and London. Henry S. Baird (1800-1875) and Elizabeth Baird (1810-1890), prominent settlers of Green Bay, documented the fur trade in their letters and documents. Henry was a territorial politician and prominent early Wisconsin settler. Elizabeth was the daughter of a British fur trader and a French-Ottawa mother. Elizabeth Baird and Henry Baird. The British remained in control the lands that are now Wisconsin until the War of 1812 — even though Wisconsin had become part of the Northwest Territory in 1787. During the Black Hawk War in 1832, the Sauk and Mesquakie Indians fought against being removed from the area. By 1836, Wisconsin finally had a large enough population to be eligible to become its own territory, a necessary step toward statehood. Henry Dodge was appointed as the first Wisconsin territorial governor. He and other territorial leaders worked to gain statehood. Twelve years later, in 1848, Wisconsin became the 30th state to enter the Union. During the Territorial Era, Wisconsin lands changed hands many times. Wisconsin was first part of the Northwest Territory (1788-1800). As the country grew and expanded westward, new territories were configured from old ones. Wisconsin was successively a part of the Indiana Territory (1800-1809), Illinois Territory (1809-1818) and Michigan Territory (1818-1836). When the War of 1812 broke out, many Wisconsin residents paid no more attention to it than they did the previous war. Most traders and Indians sided with the British rather than the Americans, though many struggled to remain neutral. When the war ended in 1814, the Americans emerged victorious. The British retreated from Wisconsin in 1815. With the decline of British influence after the War of 1812, the population of the Great Lakes region increased dramatically. The most important legacy of the war for Wisconsin was the American realization that the northwestern frontier and its fur trade needed protection. As a result, a series of military outposts were constructed in Wisconsin: Fort Howard (1816-1853) at Green Bay, Fort Winnebago (1828-1853) at Portage and Fort Crawford (1816-1856) at Prairie du Chien. Forts were built to protect not only furs, but also minerals. Europeans had known of the presence of lead ore in the upper Mississippi River area since the 17th century. Lead was needed for ammunition, so in 1822 the federal government issued licenses to mine in southwestern Wisconsin on land they believed had been ceded by the Sauk Indians in 1804. Over the next decade, miners flowed up the Mississippi River into Grant, Crawford, Iowa and Lafayette counties. By 1829, more than 4,000 miners were producing 13 million pounds of lead a year. With so much mineral wealth at stake, U.S. officials hurried to wrest control of the area from its native inhabitants. In August of 1825, thousands of Indians from Wisconsin tribes gathered in Prairie du Chien, and federal officials engineered a general treaty of peace. More than 70 treaties were negotiated with Wisconsin Indians between 1804 and 1854. These negotiations soon transferred nearly all of Wisconsin to U.S. ownership. In a single generation, under the pressure of overwhelming military force, people who had lived here for centuries or millennia lost their rights to their native lands. They were coerced to into moving west of the Mississippi River or confined onto reservations. The most dramatic event in this treaty process came in 1832, when a portion of the Sauk Indians who resisted removal were met by an overwhelming U.S. military force that triggered the Black Hawk War. An 1804 treaty negotiated in St. Louis had led government officials to believe that they had secured the right to open Sauk lands to settlement. Chief Black Hawk and a substantial portion of the community, on the other hand, considered the 1804 treaty invalid. Although Black Hawk initially moved to Iowa in 1829, in compliance with a government order, he and about 1,200 men, women and children re-crossed the Mississippi River on April 6, 1832, to reclaim their old homes on the Rock River. There the Illinois militia confronted Black Hawk's band, which fled east up the Rock River valley. Throughout that summer Black Hawk's warriors tried to hold off the soldiers while leading their people back to the Mississippi. During their retreat, several attempts to surrender were ignored or misinterpreted, and many very young and very old people died of hunger, thirst, or exhaustion. On August 1, 1832, the surviving Sauk reached the Mississippi River at the mouth of the Bad Axe River, south of La Crosse. A final surrender flag rejected by the Americans left the Sauk warriors caught between a gunboat on the river and troops on the bluffs. The next day, the Americans massacred most of the surviving men, women, and children. Of 1,200 people who had crossed with Black Hawk in April, only about 150 survived. 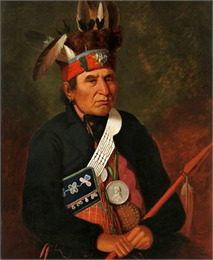 Black Hawk’s defeat sent a clear message to other Indian leaders: refusal to accept U.S. terms would lead to slaughter. With this sword dangling over their heads, the Ho-Chunk, Sauk, Meskwaki (Fox), Potawatomie and Ottawa soon gave up their lands east of the Mississippi and left the state. By 1840, most of Wisconsin belonged to the United States. The Menominee had already given up much of their territory to the Oneida, Munsee, Brothertown and Stockbridge nations, which had relocated to Wisconsin from their homelands back east. In 1854, the Lake Superior Ojibwe bands ceded ownership of the northern forests (but retained rights to hunt and fish in them forever). U.S. control over Wisconsin was complete. White settlers rushed onto land left vacant by Indian removals. Lead miners from southern states (including some with slaves) and from Cornwall, England, were joined in the 1830s by farmers and developers from New York and New England. Immigrants from Britain, Norway and Switzerland founded colonies. Wisconsin's population in 1820 was estimated at 1,444. By 1836, it had passed 10,000 making Wisconsin eligible for its own territorial government. President Andrew Jackson appointed Henry Dodge territorial governor. The first territorial representatives convened on October 25, 1836, at Belmont, the first territorial capitol in the lead region. The representatives chose Madison as the site of the future capital. Over the next decade, the land was surveyed and divided for settlement by farmers and immigrants. Territorial officials authorized roads and canals, chartered corporations and sanctioned public improvements. The population exploded to 155,277 in 1846, far above the 60,000 citizens required by law for a territory to become a state. Statehood required drafting a state constitution. In the fall of 1846, delegates to a constitutional convention argued for 10 weeks over a constitution for the new state. Their proposal outlawed private banks, allowed immigrants to vote, permitted married women to own property and left the question of black suffrage up to a popular vote. This was too radical for voters, who rejected the utopian 1846 constitution and sent delegates back to the drawing board. In 1847, constitutional delegates drafted a more moderate version of the constitution that omitted any mention of women's property rights or black suffrage and permitted the legislature to charter banks. Wisconsin voters accepted this new constitution in March 1848 and Wisconsin became the 30th state on May 29. When the census was taken again in 1850, Wisconsin's population had nearly doubled in just four years, from 155,277 to 304,456.